Most of my columns to date have revolved around electric sport models, the electric equivalent of the kind of model you would expect to find at a glow field. To me, this category spans the size range from Speed 400 to Astro 90 to large brushless powered, with styles ranging from high-wing trainers to low-wing aerobats. But, this magazine, formerly called "Sailplane & Electric Modeler", also deals with sailplanes. My 100-inch Sig Riser 100, powered by a Kyosho Magnetic Mayhem motor, 3.5:1 gearbox, a 15×12 folding propeller, and seven 2000mAh cells. To the sailplane purist, the thought of putting a power system in a sailplane at all might be offensive ("leave the winch on the ground"), but we all know the kind of performance that a sailplane is capable of, even when carrying the extra weight of its own launching system. The convenience of not having to set up a winch or arrange for a tow plane more than makes up for the extra weight. In windy conditions, a pure sailplane is often ballasted with more lead than the battery and motor in an electric sailplane would weigh. The ideal power system for a sailplane is very different from that of a sport model in the same weight range. Sailplanes have very different aerodynamic characteristics that make a sport power system unsuitable for them (and vice-versa). Let’s do a quick comparison (Table 1) of two planes of similar weight, a 48oz Fred’s Special, and a 48oz Great Planes’ Spectra. The obvious physical differences are the wing span, the wing area, and the aspect ratio (the ratio of wing span to wing chord; the higher the ratio, the "skinnier" the wing looks). The increased wing area results in a lower wing loading. This, together with the higher aspect ratio, gives a lower stall speed. The next thing to notice is that the best glide speed (the speed at which the plane will cover the most ground for each foot it descends in still air) is also much lower for the sailplane. This speed also corresponds to approximately the speed at which the plane will climb best with a given amount of power (assuming an appropriate propeller for that speed). Finally, one must keep in mind that the primary purpose of an electric sailplane’s power system is to launch the plane, getting it to soaring altitude as quickly and efficiently as possible. A sport model on the other hand is designed for cruising. Although a good climb rate is desirable, speed in level flight is also a goal (this is even more true for full-sized planes, where the goal is to actually get somewhere). 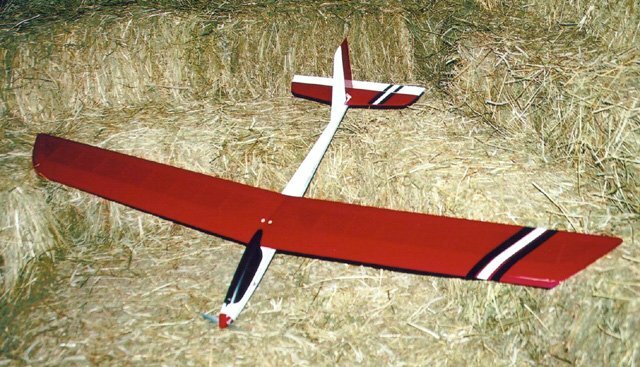 My Great Planes Spectra, shortly after I built it, using the stock motor and propeller, on seven 1400 mAh cells. It is these differences that make the best motor/battery/propeller combination for a sailplane very different than that for a sport model. Before looking at well designed sailplane systems, let’s take a look at what is commonly provided with entry level 2-meter sailplane models (such as the Great Planes Spectra, Hangar 9 Aspire, Carl Goldberg Electra, and so on). 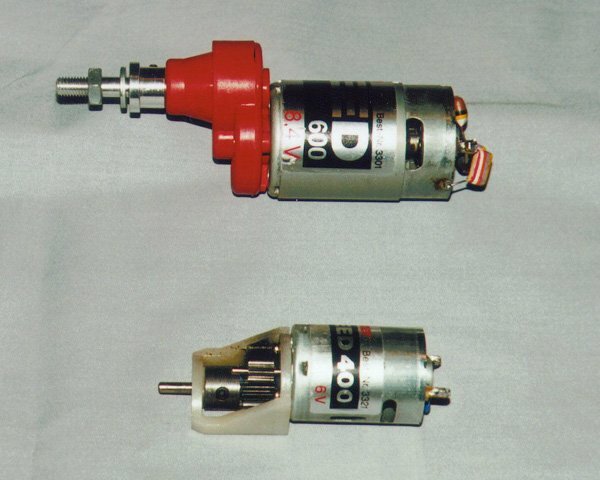 These models all come with an 05 sized "can" motor, an 8×4.5 propeller, and servo-actuated on/off switch. The recommended battery is a 6- or 7-cell Sub-C pack (e.g. 7xRC2400). This will provide approximately the levels of performance shown in Table 2 (performance will deteriorate from these levels as the motor heats up). Besides the poor motor efficiency with both 6- and 7-cell packs (around 60% in both cases), the most important thing to look at here is the pitch speed (the theoretical speed at which air leaves the back of the propeller), and the static thrust (the amount of weight the power system could lift if pointed straight up). For a sport model, the rule of thumb is that pitch speed should be about 2.5 to 3 times the plane’s stall speed. For our sport model, this would be 50 to 60 mph, and the 7-cell system would be a good choice (as a matter of fact, I flew my Fred’s Special quite happily for many years using exactly this combination of components). My Spectra after I re-engineered it with a V-tail, lighter structure, a Master Airscrew gearbox, and a 12×8 folding propeller. The same rule of thumb is not really appropriate for a sailplane, because powered-cruise is not part of the intended flight regime. Instead, power is generally used when climbing at approximately the best glide speed, which is not much higher than the stall speed. An ideal pitch speed would be closer to 2 to 2.5 times the stall speed. For the Spectra, this would correspond to a range of about 32 to 40 mph. Both the 6- and 7-cells systems we’ve looked at have pitch speeds much higher than this, which means that the propeller is not operating under ideal conditions, and thus is not working very efficiently. The other factor, static thrust, is also fairly important for a sailplane. Because these models climb best at low airspeeds, static thrust is a fairly good indication of the amount of thrust available at climbing speed. Higher thrust translates into steeper climb angles for a given airspeed. 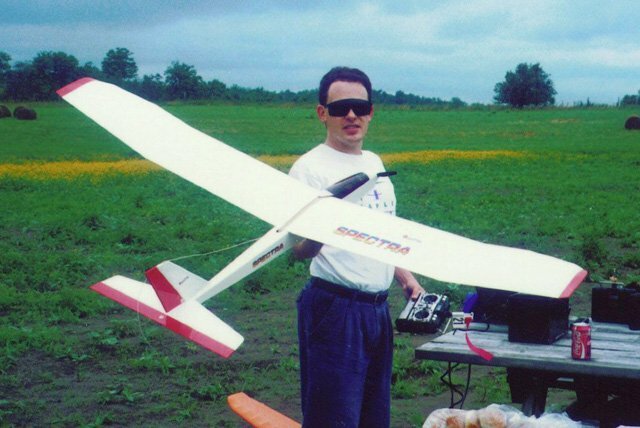 Why then are such power systems included with beginner electric sailplanes? Because they are capable of getting the plane into the air (barely), they are inexpensive, they are fairly easy to install, and they obviate the need for any research on the part of the manufacturer. The performance of a beginner’s 2-meter model can be improved dramatically without purchasing a state-of-the art high powered brushless set-up (although the prices of these have come down enough that the sticker-shock isn’t as bad as it used to be). Instead, one can make a series of relatively inexpensive improvements to make the model more enjoyable. 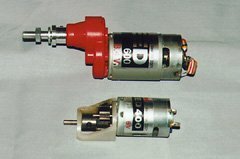 A Speed 600 motor with 2.5:1 Master Airscrew gearbox (top), and a Speed 400 motor with Modelair-Tech 2.14:1 gearbox. The very best thing you can do for better performance is to add a gearbox and use a larger, slower turning propeller, with the motor you already have (see Demystifying Gearing and Gearboxes in the March 2001 issue). The easiest type of gearbox to retrofit is an in-line planetary gearbox. Since this only makes the motor a little bit longer, it can still be bolted into the plane the same way it was before. However, these gearboxes are rather expensive. Offset gearboxes, such as the Great Planes GB-600 or those from Master Airscrew are much less expensive, but will require a bit of modification to the airplane to install (the Goldberg Electra comes with instructions on how to make these modifications). Larger propellers are more efficient than smaller ones, turning more of their input power into thrust and pitch speed. The motor can operate at a higher rpm and lower current, moving it closer to its maximum efficiency point (the "can" motor provided with most beginner models is most efficient at about 15A, and puts out the most usable power at about 25A). Because of the lower speed, it will be easier to find a propeller that provides the right trade-off between thrust and pitch speed (without the gearbox, you would want a 9×3 propeller, which is not available). One thing to keep in mind when using a gearbox is that it is no longer wise to use a servo-actuated on/off switch for motor control. The sudden application of power is hard on the gears, and can strip the teeth in short order. It is best to use an electronic speed control (ESC) or an electronic on/off control with a soft-start feature, so that the power is applied gradually. Also, if you are using a single-stage offset gearbox, you will need to reverse the connections to the motor terminals. Because the gearbox output shaft rotates in the opposite direction of the motor shaft, the motor will need to run backwards. Just adding a gearbox and suitable propeller to the provided motor can increase a 2-meter sailplane’s rate of climb by 40 to 70% at relatively low cost. The difference in performance has to be seen to be appreciated. However, there’s still room for more improvement, and the next step is to use a better motor. Here too, there are varying degrees to which you can go. The easiest motor replacement is a Kyosho Magnetic Mayhem monster-truck motor (use the "reverse" model if you are using a single-stage offset gearbox, or the normal model if you are using a planetary or other non-rotation-reversing gearbox). This motor is the same size and shape as a "can" motor, but features stronger magnets, and replaceable brushes that can handle higher currents. Table 4 gives some propeller recommendations for use with this motor, this time aiming for about 25A. The next step up is a higher-quality brushed motor, such as the Astroflight Cobalt 05 with their gearbox or superbox. This motor has even stronger, more durable cobalt magnets, ball bearings, larger brushes, and an efficient gearbox. Again aiming for 25A, Table 5 recommends some propeller sizes. The ultimate step up in performance is to install a high-power, high-efficiency brushless power system, such as one based on the Aveox F10 LMR designed especially for 7- and 10-cell limited motor run events. This motor reaches its maximum efficiency at about 60A. With a 13×7 carbon-fiber folding propeller and a 7-cell battery, this system can pull a 48 oz model straight up (although the best rate of climb occurs at about a 70 degree angle). I’ve flown my Spectra with this combination, and it is a sight to behold. 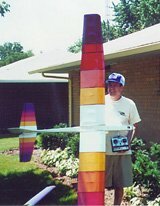 These are power levels normally associated with F5B competition models, but a 2-meter beginner’s model can handle this amount of power if properly built and flown with care (perhaps not by a beginner). Ted Youngen’s Riser 100, power by a Speed 500 motor, 2.8:1 inline gearbox, 12×10 propeller, and seven 1300mAh cells. So far, we’ve looked at 2-meter beginners’ models. In the world of sailplanes, these are far from perfect, and aren’t really intended for high performance. However, nearly everyone has (or has had) one of these, and they, especially in their underpowered stock form, are what glow fliers commonly think of when you say "electric" (although park flyers may be taking over this role). With better power systems, they would probably have more respect. The principles of power system selection for higher performance (or just larger) electric sailplanes are the same. You want fairly high thrust, and a pitch speed about 2 to 2.5 times the stall speed. To achieve this, you need a gearbox and a large propeller. This Norvel Glassair 400 is powered by a geared Speed 400 motor, a 9×5 folding propeller, and seven 600mAh cells. Unlike sport planes, larger sailplanes don’t necessarily need more cells than smaller ones. By choosing an appropriate motor that can handle higher currents, you can get more power without more cells (albeit at the expense of shorter total duration). 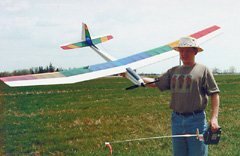 I fly a Sig Riser 100 sailplane, converted to electric power, using a Magnetic Mayhem motor, 3.5:1 gearbox, 15×12 folding propeller, and 7xRC2000 battery pack. This draws about 30A, but I keep the motor runs short to prolong motor life. Even though this model is much larger and 40% heavier than the Spectra, it flies just as well from the same 7-cell pack. The shorter motor duration in the Riser 100 is more than made up for, even in dead air, by the lower sink rate and corresponding longer glide times. Using the Aveox F10 motor at 60A, even larger models can be flown from a 7-cell battery. Of course, larger models can also easily carry the weight of a larger battery and motor. 14 years ago I started by flying an Electra 2 meter sailplane. 7X1400mAh pack 12X8 2.5 gear ratio Master Airscrew gearbox and a resistor variable speed control. Love fishin’ for a ‘free lunch’ THERMAL! Recently I get a New Kunlun electric powered sail plane 2meter wing span. What is the motor you recommend for this plane and the propeller size? I have a 2 meter glider do you have pictures of the of motor assy and battery, 7 cell. I would like to add them. Yes, take a look at Spectra-V: A Modified Great Planes Spectra.